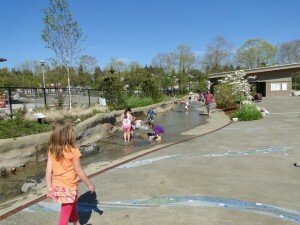 The Hands On Children’s Museum is now the first children’s museum in the Western United States awarded a GOLD rating by the U.S. Green Building Council for its sustainable building located on Olympia’s East Bay waterfront. The museum joins four other children’s museums worldwide with the GOLD rating. Hands On Children’s Museum sought certification through Leadership in Energy and Environmental Design (LEED®) Green Building Rating System™, an internationally recognized certification, to confirm its commitment to the environment. The stringent review process took more than one year. HOCM is also the first children’s museum in the world to earn Green Globe certification, a standard of sustainable building in the tourism industry. The East Bay Public Plaza is located in front of the Hands On Children’s Museum. The museum, which opened its new home to the public in November 2012, is a three-story, 28,000-square-foot building that includes a half-acre of outdoor exhibits focused on nature play. Hands On is part of a 14-acre Brownfields Program redevelopment that is restoring a former industrial site for public use. 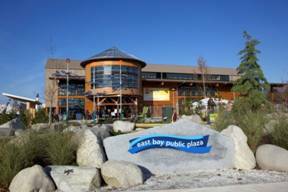 The museum is also a partner in the East Bay Public Plaza located in front of the museum, which includes a 250-foot reclaimed water feature to teach visitors about the importance of water conservation and reuse. This commitment to model a new type of children’s museum won national recognition by the Association of Children’s Museums and the MetLife Foundation as a Promising Practice in the field in 2010. The museum features regional and reclaimed building materials, low-emitting paints, adhesives, and flooring, reclaimed water for toilets and irrigation and an innovative co-generation project with the neighboring LOTT utility to capture waste methane gas to heat and cool the museum, providing low-cost energy while also reducing emissions of greenhouse gases. Families can enjoy free Friday-night admission, hands-on art activities, and face painting at the Hands On Children’s Museum. Photo credit: Hands On Children’s Museum. The Hands On Children’s Museum stimulates curiosity, creativity and learning through fun, interactive exhibits and programs for children, families and school groups. The museum’s programs and exhibits are designed to encourage interaction and inquiry, as well as participation from the entire family. A landmark destination for the region, the museum is expected to serve more than 310,000 visitors in its second year. The museum opens its doors to 85,000 children and families each year through its Free & Reduced Admission programs. 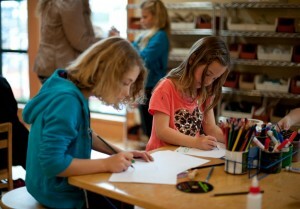 For more information about the Hands On Children’s Museum, visit www.hocm.org.